NOTE: The auction is being held at the Buena Vista Fairgrounds. 5800 - 55th Ave, Alta, Iowa. (3) DERRICK DIGGERS: Ford; Internationals / (3) BUCKET TRUCKS: International; Ford; Kenworth / 1984 Pitman AERIAL LIFT / Bomdardier TRACK MACHINE / BORINGMACHINE: Pierce Arrow / TRENCHER: Ditchwitch, walk behind / LOCATOR: # 75R, w/75 T., subsit transmit / MANLIFT: High Ranger / International TRUCK TRACTOR / DUMP TRUCK: Freightliner FL-70 13-074 / VAN TRUCK: 2004 Freightliner FL-70 / TRKS: International; Ford 4 x 4; GMC 4 x 4; Nissan 4 x 4 / CAR: 1999 Cadillac Escalade / PICKUPS: Dodge Ram; Ford F150; GMC / SUV: Chevy blazer / ATV: Arctic Cat, 4 x 4 / TRAILERS: Bul rope, 16'; Deth service car hauler; Rice pole, 5 T.; Specialty; US cargo; Fort flatbed / GENERAL SHOP EQUIPMENT. This is a general listing. Open end wrenches, up to 1 1/4". Open end wrenches, up to 2". Open end wrenches up to 1 3/4". DeWalt metric 1/2" deep socket set. DeWalt SAE 1/2" deep socket set. Files, impact wrench, allen wrench. (2) Skil, Black & Decker drills, 1/4". (2) Makita, Chicago drills, 1/2". (2) DeWalt DW 293 impacts. (2) DeWalt DW293, Makita impacts. (2) DeWalt Nikota drills, 1/4". Rubber hammers, pry bars, maul. (3) Pipe wrenhces, 24", 18", 10". DeWalt 14 v drill w/charger. Dewalt 18 v drill w/charger. DeWalt case w/ misc. tools. (2) DeWalt drill w/angle grinder. Chicago 1" impact model CP-797. (2) Bolt cutters, 30", 36". Fairmont RK6040 crimping tool, w/power pack. Huskie R060 crimp #REC 3410 w/charger. Burndy electric hydraulic pump #Y10AC-3H. (2) Burndy hand crimpers w/dies. (2) HKP wire cutters rachet type. Delta 2 gal air compressor. C/H Flux core 80 wire feed welder , 110 v.
A/R vibroground model 293 test kit. Safety glove bags, gloves, Estex bag. ESAB-PCM-500i plasma cutter, needs repair. Milwaukee 18 v., 6 T. utility crimper, w/2 batteris, charger. Milwaukee 18 v impact wrench, Charger w/2 batteries. FCI Burndy Patriot crimper 14 v.
(5) Snap-On pole line hardware sockets, 3/4" - 5/8". (6) Snap-On lag screw sockets, 5/8". (6) Misc. pole line sockets. (2) Milwaukee forcelogic crimper bags. (4) Milwaukee M18 tool bags. (5) KUNZ rubber insulating gloves, 10 1/2 - 11. (7) KUNZ leather over gloves. Salisbury arm guards, Class 2. (2) White arm guards, Class 2, w/bags. (2) Salisbury arm guards, Class 2, w/bags. Safety harness w/2 fallsafe lanyards. (2) Crimper holders for man basket. Impact holder for man basket. 92) Tool, hardware, holder for man basket. Tool, hardware, box for manlift. (2) Amber mini light, amber per mount light. (1) Amber light bar, (2) LED road flare. Speco 6" PA trumpet horn. Horn 6", remote spot light. (10) LED strobe lights, used. (3) Midwest electric boxes, enclosures. Weather Guard back rack w/light bar and horn. Hastings 35' extension switch stick. Hastings 30' extension switch stick. (4) Extention 8' switch stick. (2) Swith sticks, 7', 8'. (2) Hastings shot gun sticks. (4) Shotgun, phase holder tie stick. Chance phasing tester, 16 KV model. (2) Alum side mount tool boxes. Schumacher batter charger, 200 amps. Port A Cool cyclone 3000. Carolina horzontial band saw model HD9. MI-T hot power washer model HW2004. M-600 hose crimper, hand crimper. Ingersol-Rand air compressor, 3 phase, 2 cyl., 100 gal. Husqvarna 235 chain saw, 16". Husqvarna 136 chain saw, 16". Stihl 017 chain saw, 14". Stihl 025 chain saw, 16". (3) Chain saws: Stihl, Poulan, McCulloch. (3) Stihl chain saws: (2) man 48"; 40" 650. Subsite locator model 75R, 75T transmitter. Knaack job box, 40 x 33 x 30". Ditch Witch mole 3 1/2" -4", control valves, hose. (6) Conductor grips, 20-30 B. (6) Rubber line hose, 6'. (2) Hot line jumpers, 8'. (3) Hot line jumpers, 10'. (3) Hot line jumpers, 8'. (4) Hot line jumpers, 8'. (2) Hot line jumpers, 10'. (2) Hot line jumpers, 12'. Qty. hooks, hot phase holders. (2) Torch head, hose, gauges. (4) 5 way bar hitch. (5) Hastings Hot Arm, 6', 3 phase. (6) Hastings Hot Arm, 6', 3 phase. (5) Hastings Hot Arm, 4', 3 phase, strap. (5) Chance Hot Arm, 4', 3 phase, chain. (5) Chance Hot Arm, 3', 3 phase, chain. Wind Master road sign, "Utility Work Ahead". Wind Master road sign, "One Lane Road Ahead". Wind Master road sign, "Be Prepared to Stop". Under ground hardware, secondary encloser. (3) Dead end T3 connectors. Wedge dead ends, eye bolts, shoes. Wire sleeves, compression convections, Inslinks. large Qty. used hydraulic fittings. Bendix air dryer, points, bearings, starter. Ford 7.3 SuperChip remote car starter. Micro-Trak, speed, area distance monitor, unused. Tank heaters, control kit, misc. (6) Grease guns, transfer pump. Qty. air filters, oil filters, bearings, more. (2) Sequence indicators, 3 phase. Drivers, chalk guns, misc. tools. 1994 Chevy transfer case, 4 x 4, 3/4 t.
Altec rubber bushing wheels, pedal. Hot hoist repairkit trading ground, bullet. Best gas power pole tamper. Stihl weed eater, pole saw. (2) Ryobi, Husq weed eaters. Air hammer, w/3 star bits. G.E. parking lot light, 110 v.
(2) Line bull whip tensioners. (3) Astoria side mount tool boxes. (2) Aluminum side mount side mount tool boxes. Hand tool, shovels, post hole digger. Chevy 6.2 liter with transmission. 1994 chevy front stub, 4 x 4. 1968 Mack R600 parts truck tractor, day cab,237 dsl, did run. 1984 Ford F Series parts truck, 4 x 4, Pelican man basket 8.2, did run. 1981 Ford F-Series truck, 8.2 liter, derrick digger w/head, auger, did run. 1986 International S-1700 truck, 9.0 liter, digger digger, did run. Cat D6 dozer, w/pony, needs steering clutches, runs good. Chevy Bruin truck, 4 x 4, Cat 3208, derrick digger. Pipe pusher skidloader mount, w/jead, (2) reamers. Plate 9/16 Nissan Titan XD SL SUV, vin 1N6BIF44GN518211, miles on odo 21,000, 4 x 4, crew cab, dsl, leather. 2004 Ford F150 pickup, vin NA, miles on odo 219,127, extenda cab, 4 door, 4 x 4, cloth, new motor at 212K, 5.4 liter. 1987 Chevy utility truck, vin 1GBG6D1F7DV107423, miles on odo 107,970, dsl. power, Hi-Ranger 4F-35 PL. 1999 Cadillac Escalade SUV, vin 1GYEK13R5XR403195, miles on odo 129,816, loaded leather. 2004? International 7400 turck, vin 1HTWGAZR25J150998, 6 x 4, DT 570, auto trans, Altec derrick digger. Bombardier model 2364158710, sn 323760009, model Muskeg track Tel-Econ digger derrick, dsl. power. Tandem dual wheel pole trailer. Samsonite 1 mile pull rope. Nylon 1 mile pull role, 5/8. Hydraulid 4 roll rope trailer. Tandem axle 4 reel trailer. 2018 Big Tex gooseneck trailer model 22GNHD, vin 16VGX2528J6034125. Twin tandem axle tilt bed trailer, 24', air brakes. Single axle fuel trailer, 500 gal. Terex Coleman generator, 25 KW, 2,027 hrs. on meter, dsl. power. Ingersol-Rand portable air compressor, 2,012 hrs. on meter, John Deere dsl. power. Line pulley wheels, large qty. Tandem axle aluminum car trailer. Dynaweld triple axle trailer, w/ramps. 2017 H&H trailer, 24', V-nose. US Cargo tandem axle trailer, 16'. Ditch Witch R30 trencher, hrs. on meter 1,189, 4 wheel drive, tandem axle Belshe trailer. Ditch Witch 1820 walkbind trencher, hrs. on meter 185, w/ single axle trailer. Honda Foreman 400 ATV, 4 x 4, automatic. 1967 Bartlett DW67 enclosed trailer, 31'. (2) Chain, 8', 2 hooks. (15) Chains, short, 5', 6'. 2008 Ford F250 truck box. Tandem axle flatbed truck box. (8) Jack stand; (8) Bottle jacks; (2) Handman jacks. Hydraulic jack hammer, Caps on winch, pumps. (3) Floor jacks, (2) Trailer jacks. ALL ITEMS SELL WITHOUT GUARANTEE-- ITEMS SELL AS IS, LIKE IS, WHERE IS, UPON BUYERS OWN JUDGEMENT. "Seller disclaims all warranties, expressed or implied with the respect to the goods sold hereunder, including, without limitation all implied warranties of merchantability and fitness." Purchaser agrees to indemnify and hold Merv E. Hilpipre Auction Company and Associates, and Seller and Associates, harmless from any and all claims, damages, or losses of any kind, arising from the sale or use of the goods sold here under. Purchaser further agrees to pay for all purchases day of auction: Further agrees to pay a BUYERS PREMIUM Of 10 % for onsite purchases. A 13 % BUYERS PREMIUM APPLIES for webcast purchases. 1. The Auctioneer will announce whether the auction is with or without reserve. All rights of the auctioneer and the purchaser shall be in force depending on the type of auction. Announcements made during the sale supersede any previous announcements whether spoken or printed. Any persons selling or consigning items to the sale shall not bid on said items or is not allowed to have an associate or agent bid for them. 2. Any person desiring to procure any and all bids shall register with the Auction Co.. Registering will consist of providing all necessary information asked by the Auction Co. All person registering guarantee provided information to be accurate and warrants that he is authorized to bid on behalf of the firm or party represented. Auctioneers or Auction Co. reserve the right to refuse any applicant a bidding card and may revoke such privilege at any time. 3. All purchases must be settled in full the day of the sale and shall be removed from the premises within the time specified by the auctioneer. Payment shall be in the form of cash, travelers checks, cashier checks or checks. Checks must be accompanied by a bank letter of credit guaranteeing the check. Auctioneers or Auction Co. will have the sole right to determine if a person does not need to provide a letter of credit or if payment may be delayed. 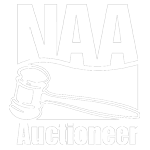 By bidding on items in the auction buyer represents to Auctioneers that he is financially solvent and all checks issued by buyer will be honored. A dishonored check is conclusive buyer insolvent and entitles auctioneer to remedies available under applicable laws. 4. All goods will be put in lots and will be sold to the highest bidder for cash. The record kept by the clerk of sale together with the marked catalog of the Auctioneer shall in all cases be accepted by the buyers as final when questions arise as to the price for which lots have been sold. Auctioneers reserve the sole right to change the order of the sale, the size of the lots, the addition or subtraction of a lot number. Auctioneers will have the sole right to determine the bidding increment. In the event of a buyers’ dispute or tie bid, the Auctioneer has the sole right to either open up the bidding for continued advancement or strike the goods sold. Auctioneers reserve the right to refuse any bid which they consider to be insignificant advance over the preceding bid. Any errors in accounting toward purchasers bill will be corrected according to the actual facts. Purchaser agrees to pay what is owed. Purchaser shall not be entitled to possession of any of his purchases until total purchase price of all his items have been paid in full. In the event purchaser fails to pay the full purchase price of any lot within the prescribed time or fails to compile with any terms of sale Auctioneers shall have retained a possessory lien on all lots of purchaser and at their sole discretion have the right to resell such lots by public or private sale without notice of any kind to purchaser. 5. Any printed literature given to purchasers such as a buyers catalog shall only act as a guide. If Auctioneers express opinion to condition or merchantability, and what price should be paid. No sale shall be invalidated by reason of any defect or inaccuracy in any of the lots by reason of their being inaccurately described in this listing catalog or elsewhere, no liability shall be born by Auctioneer in the respect of any such faults or errors. 6. Purchaser acknowledges and agrees that all good have been available prior to sale time and that he is purchasing all goods with all defects. DO NOT BID UNLESS YOU HAVE DETERMINED TO THE CONDITION OF TO THE LOT FROM YOUR OWN EXAMINATION. Buyer acknowledges sole responsibility and assumes the risk that a lot after it has been inspected might change. Auctioneer will sell lot(s) as it exists at time sold, as is, where is, with no warranties whether implied or expressed. Any and all warranties or guarantees will be between the buyer and seller only. 7. The auction sale sight shall include any location which a lot is located for display and or removal as well as where the actual bid calling in conducted. Auction sales site are considered potentially dangerous places and immediately upon registration if not before purchaser shall so notify agents, servants, and employees and others accompanying him. 8. All claims or disputes must be settled on the day of the sale at the sale site. No claims will be allowed after the removal of goods. 9. Appropriate taxes will apply. Tax exemptions accepted if purchaser produces proper documentation of their exemptions. 1. Purchaser will be responsible for complete removal of all goods purchased. Cost of removal will be the responsibility of the purchaser. 2. Auctioneer reserves the right to require proof of adequate insurance coverage from any buyer of lots requiring dismantling, rigging, or hot cutting. 3. Any damage caused to real property or other goods caused by the purchaser or his agents, the purchaser agrees to cover all damages both to the property and legal. Purchaser agrees to indemnify and hold harmless the Auction Co., Auctioneers, their agents, any and all sellers from and against any damage to property or injury to person or loss of life occasioned directly by the act or acts of buyer or buyer’s representative, agent, or employees in connection with the dismantling or removal of any lot or any other action resulting from the attendance of the purchaser to this sale. 4. In the event that the purchaser fails to remove any such lot or part thereof within said period, the Auctioneer or his designees shall have the right but shall be under no obligation to do so either in the name if the Auctioneer or other seller or the purchaser to remove, store, abandon, discard, sell or otherwise dispose of each of any part of lot bid in or purchased at the expense and risk of the purchaser without waiving any other rights that the auctioneer or other seller may have against the purchaser. Inspection can be made by appointment. Payment must be made day of auction. For onsite purchases. Cash, letter of credit accompanied by a letter of credit from your financial institutions. Buyer assumes all risk of loss at the time of the item is sold. The relationship between the Auction Co. and buyer is not bailment. All Merchandise is sold as is! Where is! No warranties are in effect!! All items must be removed from the fairgrounds property by Wednesday, May 8.